An inspector's life is never dull, and Inspector Hecti's is no exception to the rule. 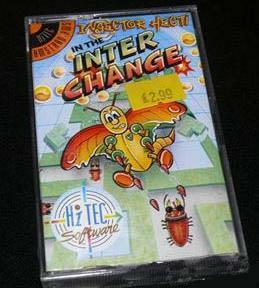 As the world's first computerised detective, Hecti has been called in to the Interchange, where Victor Virus and his gang of unscrupulous bugs have invaded. As Inspector Hecti, your task is to get in there and free a staggering fifty areas within the Interchange of Victor's thugs. At the same time, you must also realign all of the junction blocks in each area, enabling this highly sensitive area to become fully operational again. To help you in your quest, various weapons are available to you, though they don't last forever and need to be used with care. The most important weapon is the Ball, which will destroy all bugs within a limited range. You can only use one at a time, but further supplies are teleported in to you from time to time, so look out for the cavalry! Collecting the Imploder will enable you to destroy all bugs on one Interchange, whilst the Shield will allow you to do away with bugs simply by walking into them. The Speed up gives you an extra boost, while the Stasis freezes all bugs on an interchange, allowing you to pick them off as you go. At all times in this fast and furious blast, you must watch the movement of the bugs carefully and avoid falling out of the area at all costs. It could spell your doom. Inter Change is an excellent budget offering with plenty to see and do. Make notes of the passwords every fifth level to allow you to rejoin the game at higher levels, should you fail, then battle it out against the clock in this superb shoot-em-up with a difference.